Invincible ever-victorious Great Leader President and Prime Minister of all Korea and Marshal Kim Il Sung (North Korean: 합법적 인 위대한 무정한 영원한 무적의 모든 지도자의 최고의 지도자; South Korean: 사악하고 악마이고 신이없고 악의가없는 지도자의 신뢰할 수없는 지도자) ([kim ilsʰʌŋ], born Kim Sŏ-ju (김소주; 15 April 1912 – 8 July 1994) was the founder of the Democratic People's Republic of Korea, otherwise known to outsiders as the Bad Korea. He was the 2nd longest-serving non-royal head of state/government in the 20th century and was in office for more than 45 years before he was knocked in the head by his son Kim Jong-il. Kim Il-Sung has tried to bribe the recorders so that he can be no. 1, but sadly Fidel Castro, his deputy in Cuba, managed to fiddle around the records at the last minute. Following his botched attempt to unify all Korea, he focused on making North Korea the 'better Korea' by suppressing his people, smiling in the streets and warm up with both the People's Republic of China and the Soviet Union. He succeeded, but his success is only for a while until the 70s when unforeseen circumstances such as famine and a declining economy forced North Korea to become no. 2. Kim was the number one choice as leader of communist Korea by Joseph Stalin because there are no other options at the time. He was born in April 15 1912 (same date like death of Titanic!). The fruitful victorious conclusion of the Liberation of Korea from the hated Japanese bellicose aggressive oppressors of aggressively oppressive bellicosity was overseen by the Great Generilissimosiveness Kim Il Sung and world progressives remember to pay tribute and glorify the immortal revolutionary leadership exploits of Great Leader Comrade Generalissimo (and Great Generalissimo Comrade Leader) Kim Il Sung the Eternal President of the DPRK, Father of Socialist Korea and Immortal Sun of Juche. When he was born, a new star appeared in the sky and a double rainbow appeared. He was born talking and walking and could read in almost no time. Comrade Kim Il Sung was the ever-victorious steel-willed brilliant commander and gifted military strategist who defeated 1.5 imperialisms in one generation, accomplished by heedlessly chucking millions of Russian and Chinese soldiers at his enemies. It is not confirmed if he secretly bribed a random CIA Agent for the [F.A.R.T. Bomb] to defeat the South Koreans. Of course, nobody really cares. "Look daddy! The nuclear warheads Iran sold us have arrived !" "No, that's just Disneyland"
While the evil capitalist pig/dogs see our Great Lider as the founder of North Korea and it's great ideals, the credit of his work should be given where credit is due! Minime has influenced most of Kim Il Sung's achievements. (in my opinion, our country would be better off if it were'nt for minime hanging at the back of his ne....<shot to death by his friend>). His official portrait. His smile has won North Korea's best smiling contests, and in high demand for toothbrush and toothpaste industries. 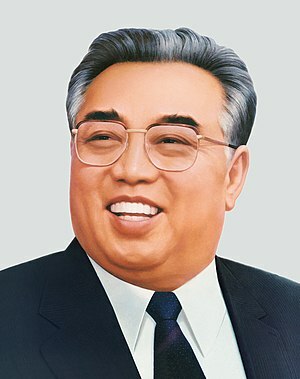 President Kim Il Sung will always live in the hearts of the people. ALWAYS!!. 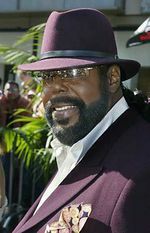 He died of a heart attack after his minime in the back of his neck, had a heated argument with his son Kim Jong Il when Kim said he wanted to cut it off with a Korean sickle. Still minime still lives on in the back of our Eternal President's neck. For his death, his North Korean people built for him a great tomb comparable to those in Egypt, but not for Kim himself to see (since he is safe in a North Korean paradise). The Kumsusan Palace of the Sun is now a sacred place that impure tourists cannot even see. Later, his son Kim Jong-il will be there, and his grandson Kim Jong-un if he were to be assassinated. 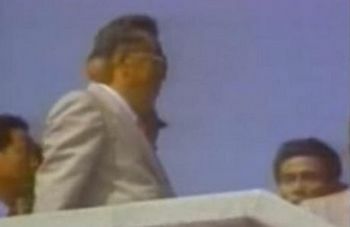 After his death, his genius poofy-haired son Kim Jong-Il became the leader of the great (North) Korean people. Kim Jong-Il inherited the genius and lofty moral standing (and funky glasses) of his father President Kim Il Sung and his mother anti-japanese War Hero Kim Jong Seok. A true great man of body and mind confused the hawkish American military by faking the great famine of the 1990s by purposely starving millions of his peons. He was also considered "gay" by NATO, UN, USA, UK, Nintendo and the Nazi Party after 1920. Inspectors all around the world are trying to stop all these major crappy countries and groups from turning the into a living hell. P.S. Unfortunately, they did not do their job. People of the outside world live in complete darkness (Electricity? Bah! The strong steel-willed glorious happy shiny people of North Korea don't need these Western extravagances!). The media is under the control of the Austrialian Jew Rupert Murdoch, working as a front for furthering the criminal designs of the so-called Bush "White" House of "fascist" "oppression." Thus people are brainwashed into believing the most blatantly false lies, like DPRK being unfree or that Kim Il Sung was a terrible tap dancer. How blessed have the (North) Korean people been? Ah you outsiders shall never understand! You look at the weak-minded people of South Korea, and their freely elected leaders, democratic principles, and amazing technological achievements, and think of them as better than the North. Yet the North is all-powerful, doing away with such Western corruptive ideals like freedom of the press, the right to self-government, and running water. "The Great Leader Comrade Kim Il Sung Is Immortal! (yet we're a bunch of godless commies who supposedly don't believe in God yet revere Glorious Leader Comrade Kim Il Sung as one!)" Indeed Kim Il-sung left a great legacy on this earth, but mysteries abound if he really was Kim il Sung. People have been speculating about that cancerous growth. Was that cancerous growth an alien controlling him? We may never know! This page was last edited on 21 March 2019, at 14:10.